A research team led by Stony Brook University investigating human and chimpanzee locomotion have uncovered unexpected similarities in the way the two species use their upper body during two-legged walking. 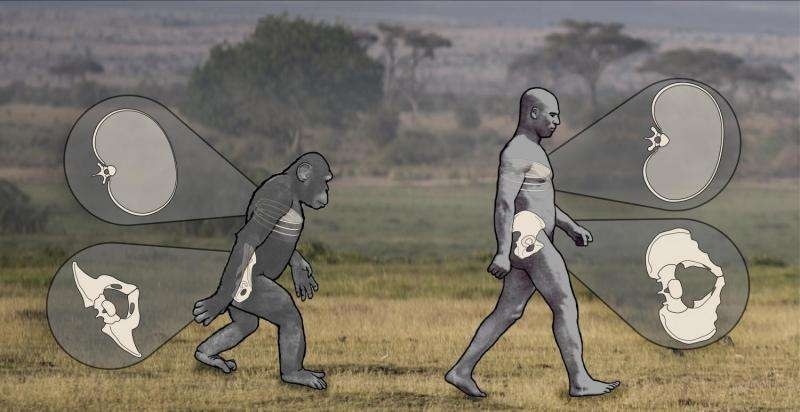 The results, reported in Nature Communications , indicate that our early human ancestors, including the famous fossil ‘Lucy’ (a species known as Australopithecus afarensis), may have been able to use their torsos to increase walking efficiency in the same way as modern humans. This image depicts pelvis and ribcage rotations during bipedal locomotion. Despite differences in overall motion, there is as much mobility between the pelvis and ribcage in humans as in chimpanzees, suggesting more human-like abilities in our earliest ancestors than previously thought. Credit: Nathan Thompson, Lucille Betti-Nash, and Deming Yang. The torso (the part of the body that includes the ribcage, belly and pelvis) of chimpanzees has long been thought to be a rigid block, best suited for a life of tree climbing. Humans, on the other hand, have long and flexible torsos that aid in walking by allowing us to rotate our upper body in the opposite direction of our lower body. The findings from the paper, titled “Surprising trunk rotational capabilities in chimpanzees and implications for bipedal walking proficiency in early humans,” changes the evolutionary view of how early human ancestors walked and what they were able to do. The research team used high-speed cameras to track and compare how the torsos of humans and chimpanzees actually moved during bipedal walking. They studied the movements by way of three-dimensional kinematic analyses and computer-generated comparisons. They discovered that the main difference between human and chimpanzee bipedalism is that chimps swing their hips much more. There is a continuing debate about how the hips of our ancestors worked compared to ours. “For instance, depending on who you ask, the 3.2 million-year-old Lucy fossil either rotated her pelvis exactly like modern humans or up to 2.5 times more,” he explained. Given this uncertainty, the research team modeled the transition from a more chimp-like pattern of the upper body movement to that of a more human-like pattern. They found that even if Lucy rotated her pelvis 50 percent more than modern humans, her upper body would have functioned essentially like ours. This means that even as early as 3.2 million years ago Lucy might have been able to save work and energy in much the same way as humans do today. Co-authors on the paper include Susan Larson, Brigitte Demes, and Nicholas Holowka of Stony Brook University, and Matthew C. O’Neill of the University of Arizona.